Two research groups at the University of Pavia have been collaborating to utilize 3D bioprinting with the CELLINK® FIBRIN bioink to 3D model muscle fibers and study cells differentiation. 3D bioprinting of murine myoblasts (C2C12) to study cell differentiation and muscle fiber physiology by 3D modelling. The present research activity about 3D bioprinting of muscle cells is carried out at University of Pavia (Italy) by the collaboration of two research groups. CompMech Group, led by Prof. F. Auricchio, has a strong experience in advanced materials, solid and structural mechanics, computational simulations but also in 3D printed materials and additive manufacturing technologies. Within the group, Eng. F. Scocozza, Dr. M. Conti and Dr. S. Marconi are dealing with bioprinting. Regenerative medicine Lab is a research group located at the University of Pavia. The group, led by Prof. Gabriella Cusella and Prof. Maurilio Sampaolesi, is focused on tissue engineering strategies for the regeneration of mesodermal tissues, in particular bone, dermis, skeletal and cardiac muscle. The competences of the team cover the complete spectrum of expertise necessary to move from stem cell in vitro culture and research to bio-complexes involved in tissue repair. Within the group, Dr. Flavio Ronzoni, Dr. Gabriele Ceccarelli and Laura Benedetti are working with bioprinting. The present research activity is supported by the two University of Pavia flagship projects: CHT (Centre for Health technologies – cht.unipv.it) and 3D@UniPV (Virtual Modeling and Additive Manufacturing for Advanced Materials – www.unipv.it/3d/). C2C12 myoblast laden into CELLINK® FIBRIN bioink were bioprinted using CELLINK INKREDIBLE+ 3D bioprinter. The bioink cartridge was connected to a 22G (0.41 mm) nozzle and placed in the printhead. Printing pressure and speed were set at 13 kPa and 600 mm/min respectively. 3D printed constructs were crosslinked with CaCl2 solution for 5 minutes. The viability and differentiation of C2C12 cells were analysed at different time points. Live/Dead assay of myoblasts laden into CELLINK® FIBRIN bioink in proliferative condition after 7 days of culture. Green: live cells; Red: cells in apoptosis. Scale bars 50 µm (Panel A), 100 µm (Panel B). 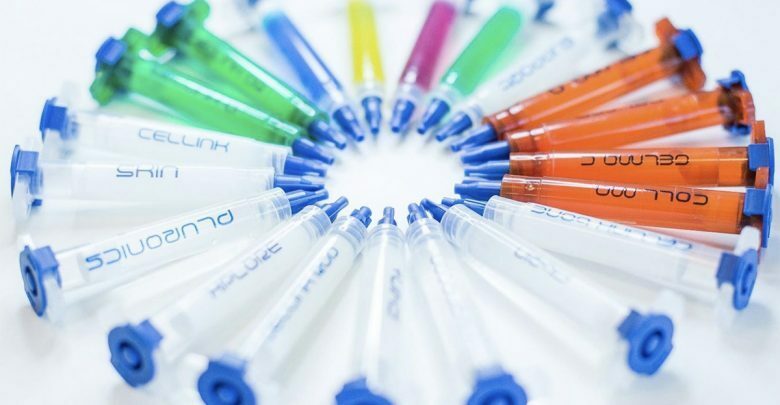 CELLINK® FIBRIN bioink is biocompatible and allows C2C12 survival and proliferation, as demonstrated by live/dead assay shown above. In addition, myoblasts can differentiate forming myotubes, as demonstrated at 7, 14, and 21 days of culture in differentiative condition, seen in the images beside. Live/Dead assay of myoblasts laden into CELLINK® FIBRIN bioink after 14 (A and B) and 21 days (C and D) of myogenic differentiation. Green: live cells; Red: cells in apoptosis. Scale bars 50 µm (Panel A, C), 100 µm (Panel B, D). -Uniform cell distribution, optimal printability and good cell viability up to 21 days. -Better cell differentiation on crosslinked edges. -Live/Dead Assay shows myotubes formation. -Immunofluorescence analysis after 27 days of differentiation shows good formation of both actin and myosin filament, shown beside. -Expression of two important master genes related to muscle differentiation (MyOD and MCK) highlight a positive effect of the 3D construct on the differentiation process. 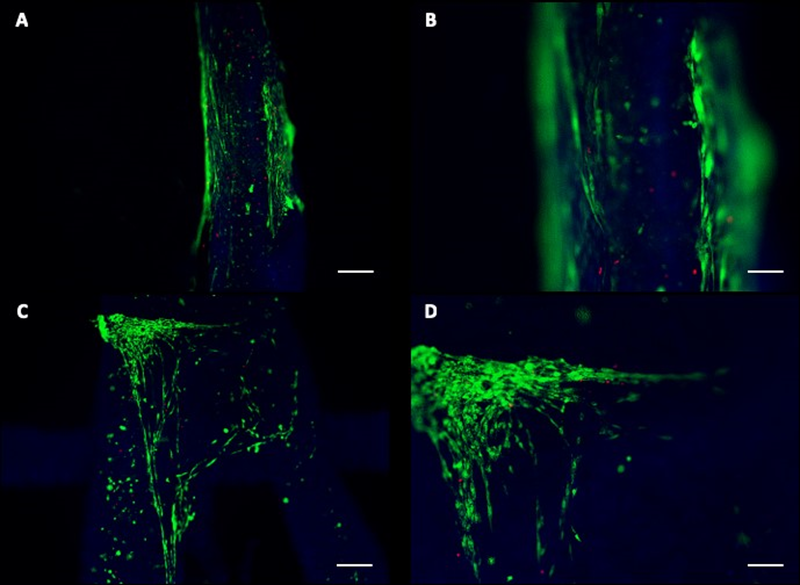 Immunofluorescence analysis revealed myotubes laden into CELLINK® FIBRIN bioink after 27 days of differentiation. Green: actin filaments stained by Phalloidin; Red: myosin filaments MF20 positive. Scale bars 50 µm (Panel A), 100 µm (Panel B). 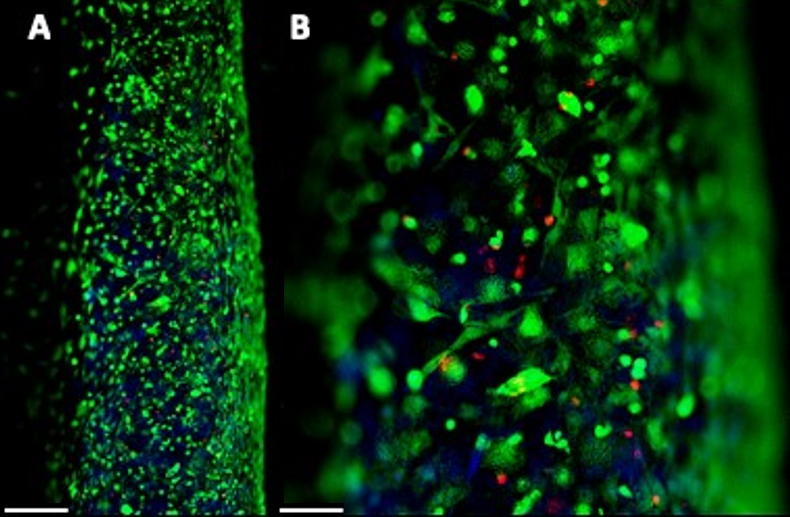 To conclude, good results can be seen 3D bioprinting the CELLINK® FIBRIN bioink with murine myoblasts. It has optimal printability, excellent viability and good level of myotube formation, however it is still lower than 2D control cells. In addition good immunofluorescence analysis and RNA extraction was obtained.